When the Lord shall enter into the world as one of us, it is already decided a certain name for Him, and an angel tells it to Joseph in a dream: “She (Mary) will bear a Son; and you shall call His name Jesus, for He will save His people from their sins." (Matt.1:21). Just think about that! This is the meaning of His name! : The one by whom God saves the sinners! He who walks in place of! “- behind him a ram caught in the thicket by his horns.” (v.13). What a situation! A thicket is something negative – just think about bramble bush! It is something that hinders you to walk forward, pull yourself up – till you bleed – and which you can hitch yourself completely to. It is apposite as a picture of sin – what man are hitched to completely, not only as an outwardly thing, but it has woven into to every little part of us, so that we have become one with it. How are we then going to get loose? You probably have heard Paul’s despondent cry, when he meets this terrible truth? : “Wretched man that I am! Who will set me free from the body of this death? “(Rom.7:24). He was stuck in the “thicket!” It had become a reality to him now. It wasn’t just one thing or the other that had to get in order – washing of hands and tubs and vessels, a few long prayers, alms to the poor etc., but trapped in the bramble bush! But this ram isn’t a role model on Paul, you or me, but here comes the message that is too strange for us: It is the picture on God’s Son! Can you think about God’s own Son, completely stuck in this thicket which is called man’s fall and sin? No, it didn’t appear in any man’s heart – but it is what the Scripture teaches us! Isaac was wondering about one thing, that his father had taken with him wood and fire to the sacrifice, but not the actual sacrifice. “Where is the Lamb?” (v.7). That’s a question it’s worth stopping for when it comes to the Christian congregation and activity at all times: “Where is the Lamb?” Because, if the Lamb isn’t there, then everything is in vain! You probably look at the congregation’s activity and confession (the wood), and all the enthusiasm and ardent – possibly also gifts of the Spirit in function (the fire) – but then maybe you are one of those who have seen further into the truth, you are one of them who knows what (whom) you were saved by – by what (whom) you were moved from darkness to light – and then you start to wonder: Where is the Lamb in all this? Oh yes, I see the fire and the wood, but where is the Lamb? The Lamb of God who takes away the sin of the world! (John 1:29). Him whom I always have to have my eyes fixed on, because of the “thicket” in me. That which always threatens to take over and strangle the new life! The sin that poisons everything, and makes it hard to believe that I belong to the Lord! The only solution again and again, is to get your eyes fixed on the Lamb! Not on the wood and the fire – because that cannot save or comfort a sinner in his need – but the Lamb! It was this that calmed Paul down when he came with his despairing cry, and later made him the greatest missionary who has walked on this earth! Just listen: “Thanks be to God through Jesus Christ our Lord!” (Rom.7:25). If we were to remain in this passage and ask: What did Paul see? Yes, what did he see? He saw the Lamb that Isaac sought after! “Abraham said: God will provide for Himself the lamb for the burnt offering, my son!” Yes, this is what Paul saw: The Lamb that God had chosen! Jesus Christ! You probably know the titles that he carried this great missionary? It wasn’t titles of honor, like most of us wants – it was: “As to one untimely born!” (1 Cor.15:8). “The very least of all saints!” (Eph.3:8). “The foremost of all sinners.” (1 Tim.1:15). It was surely nothing that he made up, when Paul himself cried for and preach for others, a savior and reconciler! Is it really true that this holy Son of God, was completely stuck in the sins and trespasses’ thicket? Can it be? Listen to what the Word says: “He made Him who knew no sin to be sin on our behalf.” (2 Cor.5:21). Made Him... to be sin! We more than assume that we are on holy ground here. We cannot comprehend what is going on here – but it is written there so that we can ponder upon it. He isn’t only the atonement for sins – in the degree we can say only in this context – but He is made to the actual sin, made to the actual “thicket,” removed and thrown on the fire. 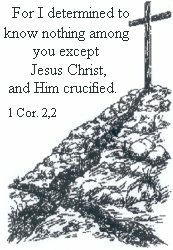 You see Him there He hangs on the tree of Golgotha under God’s wrath - His consumings fire (Heb. 12,:29), outside the wall, outside among the people with leprosy, the thieves and the people whom no one wanted! There is only one thing here that you mustn’t overlook: In Him! By the Lamb! If not, you to will be asked: Oh yes, I can see both the wood and the fire, but where is the Lamb? I mentioned that we more than assume that we are on holy ground, when we read this verse in 2 Cor.5:21. Just think about whom this person is who is made to be sin. God made to be sin! God made to this “thicket” that us humans get stuck to, and thrown on the fire! Then we don’t dare to say so much more! But look now to Golgotha! That is what being preached to you there! “Abraham went and took the ram and offered him up for a burnt offering in the place of his son.” In the place of! That is our rescue! And that is our entire rescue! Everything else is in case a fruit by this! If not, it is only wood and fire, and therefore without the most substantial: The Lamb! Just consider two things: Just think if God hadn’t chosen any sacrifice, to be in effect in your place! Where would you go? Completely bound, on the way to an eternal destruction! But then the other thing: God has really chosen a sacrifice, to be in effect in your place! Then what? Then you are completely set free, on the way to the eternal beatitude! The beatitude is already yours here and now – as Paul testifies: “For Christ our Passover also has been sacrificed.” (1 Cor.5:7). In relation to that, he says: “Clean out the old leaven so that you may be a new lump, just as you are in fact unleavened.” There isn’t to kinds of salvation – there isn’t two ways to live in communion with God in. There is one! He who was delivered over because of our transgressions, and was raised because of our justification! (Rom.4:25). God has chosen a sacrificial Lamb, and He has slaughtered it – in the place of you! We also read something strange in the 5th verse in our passage: “Abraham said to his young men, "Stay here with the donkey, and I and the lad will go over there; and we will worship and return to you." “- we will worship and return to you." Abraham was no liar, so he must have more than known that God would find a solution for this, so that he got his promised son back with him. Abraham knew God! The letter to the Hebrews writer give us a little insight in this, as he writes: “He (Abraham) considered that God is able to raise people even from the dead.” And as we now have seen: “From which he also received him back as a type.” (Heb.11:19).